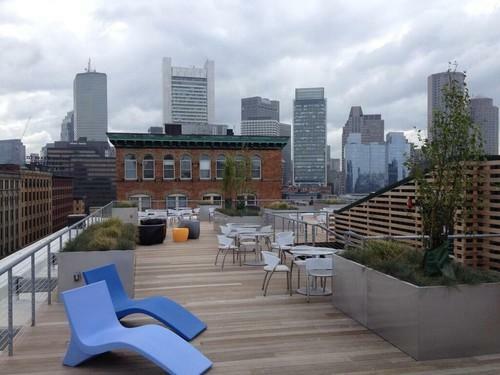 LogMeIn's roof deck offers view of the Boston skyline. To attract workers in the competitive technology job market, remote connectivity service provider LogMeIn decided that a change of address was needed. For about a decade, the company was based in an office park in Woburn, Massachusetts, a suburb 10 miles north of Boston. But as LogMeIn discovered that younger tech workers preferred to live and work in the city, in 2013 the company moved to a trendy waterfront Boston neighborhood and turned a former warehouse built in 1904 into its loft-like headquarters. "We felt that for us to continue to attract the talent we wanted and compete with companies, getting into Boston would be better for us for talent recruitment," said Chief Financial Officer Jim Kelliher, who helped spearhead the move. Location, long an important factor in real estate, now ranks as a concern for companies hiring IT workers. Younger employees versed in the latest technologies are opting to live in urban settings and favor taking public transportation to the office over driving to the suburbs. Employers, eager for staff with trendy skills like mobile development, are taking steps to keep their companies appealing to city dwellers. Some have traded suburban offices for vibrant city locations while other companies, most notably those in the Bay Area, operate private shuttles between San Francisco and their Silicon Valley headquarters. "The commute conversation is really taken off the table," said Dena Upton, LogMeIn's head of human resources. "It's much easier to get people to respond to our email when we're doing an outreach campaign for a position than when we were in Woburn." LogMeIn isn't the only Massachusetts company looking to set up in Boston or neighboring Cambridge, according to internal staffing data from recruiting firm WinterWyman. Between 2004 and 2013, the percentage of software jobs located in Boston soared to 36 percent from 5 percent. The percentage of software positions in Cambridge, where technology heavyweights including Microsoft, Amazon and Google have opened development offices, increased to 27 percent from 20 percent. By comparison, the percentage of software development jobs in Waltham and Burlington, suburban cities traditionally associated with the state's technology industry, declined by more than half during the same period. In Waltham the percentage decreased to 6.43 percent in 2013 from 16.7 percent in 2004. In Burlington, the drop was to 3.22 percent from 12.9 percent. Many large, established IT businesses with locations outside of Boston are either reducing IT headcounts or not adding positions, said Ben Hicks, who compiled the data and is a partner in WinterWyman's software technology search practice. Instead, small and medium-sized companies based in the city are hiring. "If I have a job seeker who says 'I want to work out in the suburbs and I want to work for a big multinational publicly traded company,' it's hard to place that person since so much of the job activity is in the city and so much of the job activity is with small companies," said Hicks. Even if major technology companies in Boston's suburbs began hiring, "I don't think it's going to reverse this trend, but it's going to balance it out a bit," he said. But since small and medium-sized companies prefer to set up around similarly sized companies, technology hiring in Boston would still skew toward positions in the city. "If you're a big company that's outside of the city and you're looking for less senior level people to add to your team -- people either right out of school or have a handful of years in the industry -- that becomes very difficult," Hicks said. Companies in Silicon Valley face similar challenges with younger technology workers preferring to live and work in San Francisco, said Megan Slabinski, district president for staffing firm Robert Half Technology. "Millennials want to live closer to cultural centers. It's hard to get them to want to work outside of the city," she said. To ease the commuting concerns of city dwellers, companies including Facebook, Google and Apple run shuttle buses that ferry workers from San Francisco to their respective suburban campuses. Other Silicon Valley companies try to locate their offices close to subway and train lines running from San Francisco, Slabinski said. "The objection of someone working outside the city tends to go down when we can talk about their public transportation options," she said. Suburban companies that need younger workers and their knowledge of trendy technologies should recruit from colleges near their offices before students graduate and move to the city, Slabinski said. In the case of Bay Area companies, she suggests recruiting from colleges in Sacramento, which is about a 90-minute drive from San Francisco. Another option is to encourage experienced employees to enroll in training programs, like coding camps, where they can learn in demand skills, she said. "There are really talented people all over the Bay Area. Companies just might need to adjust their expectation of the talent pool they're looking for," Slabinski said. Suburban companies hold advantages in technology recruiting, she said. There can be less competition for candidates outside of urban areas and candidates with deeper experience levels -- and families -- tend to live in the suburbs. LogMeIn initially feared that its more experienced workers who commuted from New Hampshire would leave the company since the move to Boston would increase their travel time. To counter the longer commute, the company allowed employees to have flexible work hours and permits some telecommuting, said Upton. So far, attrition hasn't spiked, she said. "We tried to create an environment that it might be a little harder for you to get here but once you get here, it's going to be more fun," Kelliher added. LogMeIn's office was designed with an open floor plan without offices to encourage collaboration, Upton said. The office has a roof deck, a gym and conference rooms named and decorated after the three cities where the company has offices. The London meeting space resembles a library and the Dublin space looks like a pub. Sometimes simply being in a city isn't enough to lure IT workers. In New York City, technology companies need to be located in the right neighborhood, said Mike Fitzgerald, a partner in WinterWyman's New York office. Startups are clustered in neighborhoods below 35th Street and in Brooklyn so candidates expect companies that bill themselves as startups to be in those same areas, he said. "To be a startup at 52nd Street is a little bit a fish out of water. You get a little bit of an inquisitive tone [from a candidate]. It's a very different vibe and I have seen instances where candidates will note that," Fitzgerald said. Working for a startup in the Midtown section of Manhattan may not be appealing, he said. "It's just such a different feeling there compared to Flatiron or Chelsea where there is a significant concentration of startups that are all blocks away from each other," Fitzgerald said, referring to two neighborhoods populated with tech companies. For bitcoin exchange itBit, though, a Midtown location suited the company's efforts to attract IT workers from in the finance industry. The company was so keen on hiring staff with this niche background that it recently relocated its headquarters from Singapore to New York to be closer to candidates who have worked at the major financial services and investment companies. "We need people who have deep financial technology experience and really that only exists in Wall Street," said Chief Operating Officer Andrew Chang, adding that even Silicon Valley lacks workers with the financial technology background his company needs. ItBit's office helps it compete for talent with banking and investing heavyweights like JP Morgan Chase and Goldman Sachs, which offer generous salaries. "We're trying to convince him or her that we have long-term prospects as a company. Part of that is where we are located and what our offices look like," Chang said. ItBit considered other New York City neighborhoods, but they didn't offer the public transportation options or building security that the company needed. Being located near Grand Central Station provides easy commuting options for employees who live in Connecticut, New Jersey, Long Island or other parts of the city. And opening their headquarters in the suburban cities of Greenwich and Stamford, Connecticut, both home to hedge fund companies and financial service firms, would have cost the company workers who live closer to New York City. "We were always going to be in Manhattan. It would be really tough to go to Connecticut. You lose all those New Jersey and Long Island people for the most part. It's kind of a no brainer for us to be in New York," Chang said.